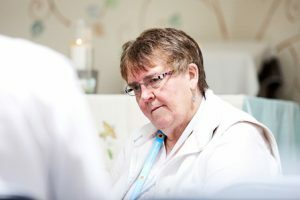 A stay in the Hospice can be an uncertain time, whether you are a patient, relative, carer or friend. All Hospice staff are committed not just to your physical care, but also your spiritual care. Our spirituality is that which makes each of us unique. It relates to those things in which we find meaning, hope, love and purpose. For some it will be reflected in what they have achieved in life or who have been the key people in their relationships. For some it may have a religious element expressed in a belief and practised through a particular faith. If you do follow the practice of a particular faith and would like your own minister, priest or religious leader to visit whilst you are here, they are welcome. We do offer times of prayer and anointing with oil. If you would like to receive Communion at any time this can be arranged; either via your own minister or the Hospice Chaplain. We currently hold a short Quiet Time Service on Mondays at 11:45am. The Hospice has a chapel, where you can sit, have space or listen to music.